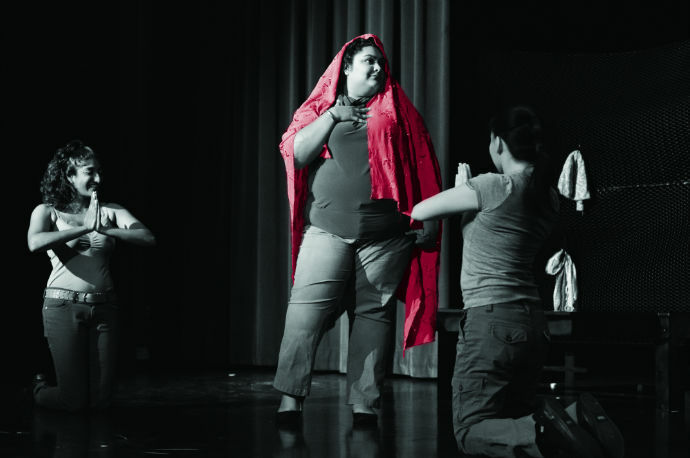 Performers YaliniDream (left) and Kelly Zen-Yie Tsai (right) act out a scene in which their characters pray to Mary Magdalene, portrayed by Adeeba Rana (center) during the “Say You Heard My Echo” event. Photo-illustration by Daniel Green. One of these voices belongs to Kelly Zen-Yie Tsai, a Chinese-Taiwanese American writer and artist from New York. Alongside her are performing partners Adeeba Rana and YaliniDream. Tsai presented her three-act play “Say You Heard My Echo” at the Stevenson Event Center on April 13 through the Cultural Arts and Diversity Resource Center, Student Union Assembly and Rainbow Theater. The show was produced by Tsai’s associates from Moving Earth Productions, the Asian-American Arts Alliance and director Jesse Jou. The show explores the impacts of 9/11 on three fictional Asian-American women living in New York City a decade later. Their struggles with survivorship and faith prompt them to call upon three female religious icons: Mary Magdalene, Guan Yin and Aisha. The women undergo separate transformations as the years following 9/11 prompt change in their political, social and personal lives. The ever-present female religious figures act as mirror representations of the characters and help facilitate their fulfillment, guidance and enlightenment. Tsai, who grew up in the culture of poetry slams in Chicago, has been able to take her love for spoken word around the world to places including Trinidad and China. “Spoken word poetry at its very best allows people’s authentic stories, relationships to language and rhythms to shine through [in] a unique, culturally specific way,” Tsai said. Act One illustrates the damaging effect of monotony and silence — a Catholic burlesque dancer’s survival mutes her expressiveness until she becomes immersed in the anti-war movement. The second act chronicles the unsettling downward spiral of a Buddhist Iraq War veteran and hip-hop emcee who suffers from post traumatic stress disorder upon her return home. The final act addresses the issue of families burdened by detention and interrogation as a Muslim librarian struggles to stay connected to her grandfather. Themes such as the fight for cultural pride and struggle for survival occur throughout the play and serve as a primary focus to connect these three female characters to their respective religious icons. “I was playing guitar … and heard the words ‘say you heard my echo,’ then I saw an image of a woman being pursued by Mary Magdalene in New York City,” Tsai said. Tsai’s goal is to show the depth of the experiences that marginalized groups undergo, with special investment in the personal aspects of her identity as a woman who is Asian-American. “‘Say You Heard My Echo’ shows the breadth and depth of my own humanity through the work that I do … The honesty resonates with people far beyond myself,” Tsai said. After the show, Don Williams, the director of Cultural Arts and Diversity at UCSC addressed the audience about the significance of a valued community through performing arts. “Our goal is to receive a variety of scripts that deal with many cultures and there’s a lot of cultures that are never written about,” Williams said. Williams is engaged in the ongoing production process of performances that celebrate diverse cultures. “We here at the UC, especially Rainbow Theater, are always looking to seek Asian-American one-act plays,” Williams said. “Rainbow! Rainbow!” echoed supporters in the crowd. The previously barren stage found its emptiness overwhelmed by the powerful presence of everyone involved as a unified body. The performers of “Say You Heard My Echo” were surrounded by the embrace of laughter and liveliness by the student communities of Don Williams and the students of Cultural Arts and Diversity Resource Center, Student Union Assembly affiliates, and performers from Rainbow Theater. “No matter how we feel on a given day, we’re never as spiritually or emotionally alone as we may feel,” Tsai said. To follow Kelly Tsai’s performances and material visit yellowgurl.com.